Carry around all your extra Pokeballs in this holographic Ditto purse! This Pokemon crossbody bag is made from faux leather and is iridescent too, so it looks like it’s just about to transform! He makes the perfect choice to carry your belongings. In their true form, Envy is a small, caterpillar-like serpent with multiple legs and a jaw-less, sucker-like mouth resembling parasitic flatworms. Now it has been fan made into an adorable little plush toy! Made from soft anti-pilling fleece and felt teeth. Make any workstation a little brighter with these stunning light-up Pokemon sculptures! Customize an order by choosing your favorite companion, along with it’s own habitat that is hand painted and fitted with LED lights! If you’re the type of person who wants to game all day and not worry about anything else, this t-shirt is for you! Featuring the laziest Pokemon, this funny Pokemon tee sports a parody of Snorlax together with a parody of Nike’s catch phrase. Dress like the most fashionable creature in the Pokemon kingdom with the Zangoose fur scoodie. This majestic faux fur hood contains paw mittens in the long and cozy scarf to keep your hands, as well as your neck and head warm. Pokemon can now be caught sleeping under a cherry blossom tree in these adorable sakura themed snow globes! The limited edition collectables are a great way for fans to celebrate Spring time in Japan with their favourite Pokemon. Decorate your laptop or sketchbook in style! This wicked holographic sticker features a original artwork inspired by the item boxes in Super Mario Kart. A rainbow of colors will appear when light is reflected off this awesome decal. 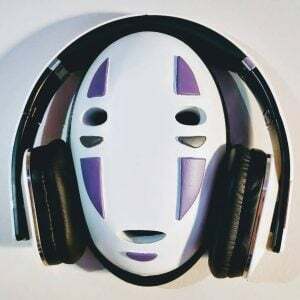 No-Face, the iconic and mysterious and lonely spirit from Spirited Away that offers you whatever you desire is now here to hold up your headphones. Fans of Studio Ghibli and Miyazaki will love this fan art inspired headphone wall mount. Finally, 3D printers now cater for Water-type Trainers too! Complete Lapras’s shell by topping it off with the perfect little succulent and watch it evolve! The ideal addition to any Pokemon fan’s desk. Available in three sizes! I choose you, Pikachu! Stay fully charged while on the go with this portable Pokeball charger! Not only does it also work as a nifty flashlight but the mini projector showcases a fun image of everybody’s favorite electric-type Pokemon. You won’t be needing to cut any grass or smash pots to get your hands on these rupees. You just need a credit card! These beautiful gemstones are cut to resemble the in-game currency from the Legend of Zelda series. It’s about time that you finally rewarded yourself for tearing up the race track with your mad Mario Kart skills! These 3D printed Mario Kart trophies create the perfect addition to any shelf of an experienced Nintendo fan. Make Charizard come alive by keeping a special place in your pocket for everybody’s favorite fire Pokemon. Once flicked on, Charizard will blast fire from his mouth! A must have part of every fire-type trainer’s essentials. Look like a total badass that just walked right through the gates of Wall Maria – prepared for outside exploration and Titan slaying. If you’re going to be humanity’s last hope for survival, you better act like it! Even an experienced mage needs to relax after a hard day of beating the bad guys! These extra large bath bombs each contain your choice of a Fairy Tail keychain or figurine inside. A great reward for kids and otakus who bathe regularly. The Pokemon meme that broke the internet is now in sticker form! Printed on weatherproof matte white sticker paper, this decal perfectly captures the famous surprised Pikachu meme for you to slap on just about anything. Show off your honor and keep warm while hunting Titans in this Survey Corps beanie! The Attack on Titan beanie has a knit Scout badge on front and a fold-over cuff. The perfect way for a Survey Corps wannabe to keep warm this winter.